Kingsland, Georgia – Camden County (7-3) came into the contest with a nine game losing streak in region play and they hadn’t made the playoffs since 2015. Well the Wildcats laid everything on the line Friday night pulling out a 28-24 victory over Tift County (6-4). It sure didn’t look good early for the Wildcats as Tift County jumped out to a 14-0 lead in less than five minutes. Special teams would end up playing a huge role in the Wildcat come from behind win. Ronnin Wright blocked two Blue Devil punts each leading to a scores. The first ended with a fake punt attempt as senior tight end Trace Dorminy hit Wright from 35-yards out. The second block was scooped up and ran back by junior cornerback Jordan Billups. Camden County would then take advantage of a failed onside kick by Tift County to start the second half. Less than two minutes later sophomore backup signal caller Cody McCartha hit a streaking Logan Berryhill from 28-yards out to give the Wildcats the deciding score. With the victory the Wildcats claimed the third seed from Region 1-AAAAAAA and will travel to Marietta to take on Walton (9-1). Tift County dropped to fourth in the Region and earned the GHSA-AAAAAAA At-large bid. They will head north to take on Roswell (9-1). Below are some of participants from the contests that displayed the size, athleticism and football acumen worthy of attention from college recruiters. Some of the standouts are not household names, but could be in the near future. Though only eight players were chosen for this piece, 23 potential prospects were included in the XOSDigital Weekly report. This report goes directly to 200-plus DI college coaching staffs, most of which are FBS or FCS. The bottom line is college coaches are the ones that need to embrace your skills, not fans. Ajiero came into the contest as the leading receiver for the Blue Devils. It was obvious why he is the go-to-guy after making an incredible catch in tight coverage for the second score of the game. Though not the biggest receiver he does a great job of creating space and finding the soft underbelly of the defense. He finished the game with seven receptions for 85 yards, several extending drives. Ajiero possesses excellent change of direction and has very good top end speed. He also does a great job of attacking the ball with his hands. I’m not sure what he has going on in recruiting, but clearly he has the ability to play in a pass happy offense at the next level. McDaniel is easily the most impressive looking prospect on the hoof for Tift County. This athletic defensive end is quick off the ball and excels at wreaking havoc in the backfield. His combination of size and athleticism will allow him to project as an outside linebacker at the next level. That being said he has the frame to add additional muscle mass and stay as a 4-3 pass rushing defensive end. On the evening he recorded six tackles, two QBH’s and one TFL. After ten games he leads the team in sacks and quarterback pressures. His skillset will be greatly needed in the first round versus Roswell. McDaniel gave a verbal commitment to Kentucky way back in February. A physically impressive long receiver is the best way to describe Turner. He is in the size range of a perfect hybrid tight end/receiver prospect. Versus Camden County he caught five passes for 77 yards and one touchdown. Most would have been impressed with his streaking 44 yard reception down the deep third of the field. But the catch that really stoked my interest happened on the final drive. Turner reached back somehow and caught an off target pass, all hands, while moving in the opposite direction of the ball. Those are the type of catches that attract the attention of college coaches. His size and body control make him a physical mismatch for most defensive backs. Turner currently has four FCS offers Campbell, Charleston Southern, Samford and Tennessee Tech. If you’re looking for the textbook definition of a true road grader, than Williams is your man. This behemoth is thick from head to toe, possessing a massive powerbase and huge polar bear limbs. Once he locks onto his defensive adversary he simply drives his feet rendering them powerless. Williams does a great job of getting into his pass set and keeping squared up on the defender. Though he plays offensive tackle for Tift County; he most likely projects as a guard or center. And yes, during warm-ups he worked as an extra center for the backup signal callers. Williams is currently the most coveted player on the Blue Devil squad, boasting 20 offers which include Indiana, Iowa State, Maryland, Minnesota, Pittsburgh and South Carolina. His biggest asset is his versatility and ability to play more than one offensive line position in college. Felix came into the contest as Camden’s leading rusher; nothing changed Friday night as he received the bulk of carries. He finished the evening with 19 totes for 80 yards and one touchdown. Felix already has good size for a running back and he understands the importance of running his feet after contact. Midway through the fourth quarter on third and one Felix delivered, gaining 17 yards and moving the chains. A few plays later he gobbled up 23 yards while breaking several tackles. Though the Wildcats didn’t score on that drive they did chew up valuable time. He demonstrated excellent change of direction and very good top end speed. Being an impact freshman in Region 1-AAAAAAA should grab the attention of college recruiters. Fogle missed several games with an injury, but after watching his performance versus Tift County it’s safe to say he is back to full strength. This long athletic linebacker racked up ten tackles, three TFL’s, two QBH’s and one sack. Fogle made plays in the box, in open space, on special teams and most importantly he created mayhem for the Blue Devil passing game. The play that really stands out occurred in the fourth quarter on third and ten with Tift drivi.. Fogle was able to make a solid open field tackle for loss on Ajiero forcing a fourth down. He possesses excellent length and a frame that will easily hold another 30 pounds of muscle mass. He is athletic enough drop in coverage and a terror coming off the edge. 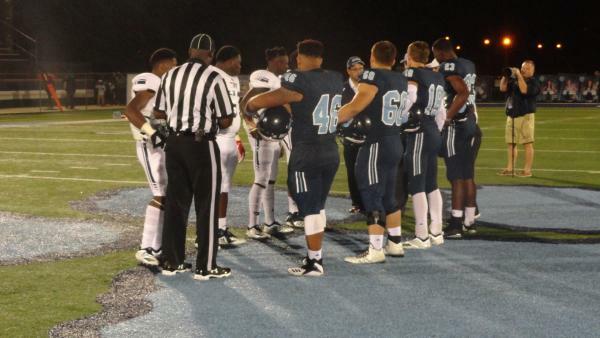 When college recruiters come to Camden County they need to ask Coach Sphire to physically eyeball Fogle. Then, just maybe they’ll see what I’m talking about. Morris is already a household name holding 15 Power-Five offers. And watching him go through drills it’s not hard to fathom that the current offer list will only double. Morris is a massive natural hip and knee bender that could play either offensive tackle position at the next level. He did have his work cut out for him going against Kentucky commit KD McDaniel a good chunk of the night. Morris is very nimble for his size and has the ability to completely stonewall defenders that try to go right down the middle. With just a single-arm punch Morris can throw any pass rusher off kilter. Let’s face it these types of bodies are extremely rare, and to think he just turned 15 years old. How good will he become by his senior season? Having seen his progress over the past two years the skies is the limit. This long and lean hybrid safety/linebacker had a first half one could only dream of. Camden was down 14-7 and simply looking awful on both sides of the ball until Wright’s first blocked punt. On the ensuing possession Wright caught a game tying touchdown on a fake punt to knot the score. Then moments later he blocked his second punt, this one was scooped up by teammate Jordan Billups to give Camden County its first lead of the game. He also added three first half solo tackles. Wright possesses excellent length and has the frame to possibly project as an outside linebacker. If he does play safety at the next level he will most likely be lined up somewhere near the line of scrimmage. The MTSU commit is chalked full of quick-twitch muscle fibers and don’t be surprised if other colleges come calling prior to Signing Day.